Sister's DIL gave birth to the newest member of our family. This is the firstborn of my nephew and his wife and they are just thrilled. 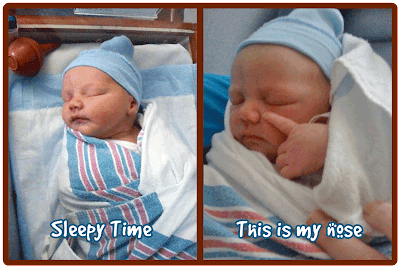 Ian David joined our world on Saturday, December 5, 2009 at 9:14pm EST. Ian weighed in at 9 lbs. 2 oz and was 20.5 inches in length and was born at Fort Stewart in Georgia. According to the doctor's they were expecting a baby at around 7 lbs., so Ian's size was a complete surprise. Mom rose to the occasion and the birthing process went off without a hitch. I must tell you though, this is not a record weight for our family. I weighed in at 9 lbs. 3 oz. and my son, you know the Tiki Carver, weighed in at a whopping 9 lbs. 13 oz.! Daddy will be leaving for Iraq shortly, so for now, time is precious and daddy is just beaming with pride. One of the gifts I bought was a little outfit that said Surfs Up on the front and on the rear end it said Wipe Out! It was the cutest thing and I thought very fitting for a great-nephew of mine. Now I don't want to leave out Ian's cousin, who has been visiting The Hut since Thanksgiving and will be leaving in just a few hours. 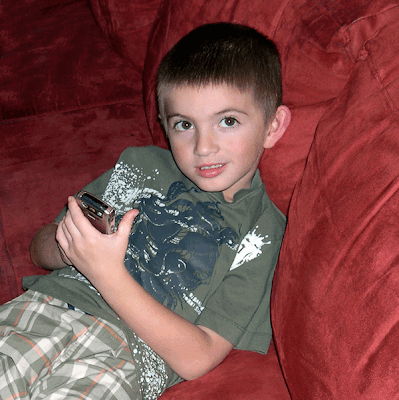 Landin, who was born in Hawaii, is now 5-years-old. I'm an early riser and whenever Landin visits the first thing he does when he wakes up is to head to my studio to announce he is awake and ready for breakfast. He has done this since he was old enough to walk and he is a welcome visitor. Oh, don't you just love new babies! Your big boy is very handsome too...good genes in the family! Congrats! He's beautiful! ...and so is his nose! What a sweety..., both of them really. Too bad that Dad has to leave. What a beautiful new baby nephew. Congrats to you! And that's a mighty handsome young man in that last shot. You are surrounded by cuteness with those two! Congrats..He is adorable. My first nephew is also coming. We are expecting him in the first days of the new year..
Little Ian David is adorable. I love your comment about the nose! !